Last month while inspecting the green roof, Gardener Lars Rasmussen noticed extensive damage to the plantings on the roof. It appeared as if someone had come along, pulled up the sedum, and began digging in the soil. On a subsequent visit, gardeners startled crows digging in soil and pulling up the sedum. Upon closer inspection, it was realized they were feasting on a population of newly hatched grubs in the soil of the green roof. These c-shaped white grubss were Phyllophaga spp., May/June Beetle. During seasons of drought, lawns and garden areas where these beetles typically lay their eggs are compacted, making it a challenge for these beetles to burrow into the soil to lay their eggs. 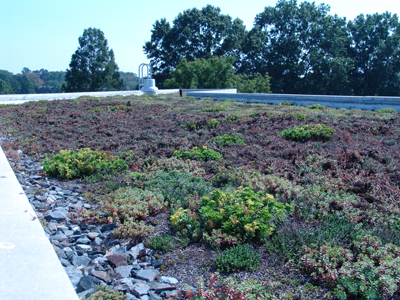 Thus they were attracted to the loose, aerated soils specially designed for green roofs. Once the grubs began to hatch, birds also found this soil ideal for hunting and eating them, resulting in a roof of uprooted sedum. Homeowners often notice infestations of these grubs after their lawns have turned brown and yellow. In extreme scenarios, the lawn may roll up like carpet or sod. During a seasonal drought, the beetles prefer to lay their eggs in irrigated lawns. In the end, those who have irrigated throughout the drought will see damage while their neighbors may have none. 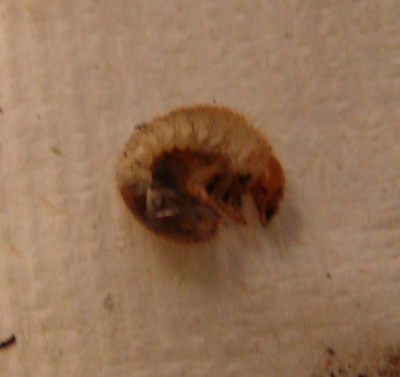 Ideally this pest should be treated during the grub phase instead of the beetle phase. 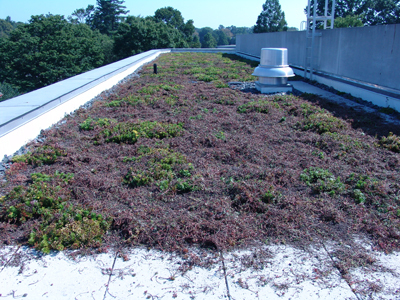 After treating the roof, cuttings of the sedum were scattered over the damaged areas. They have already begun to root and are sprouting new green growth. 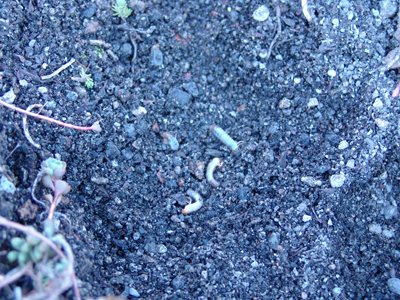 As an interesting side note, the grubs and birds did not disturb Sedum kamtschaticum. What did you to use treat the roof? Hopefully not a toxic pesticide? I actually had to water the gdaren this morning. We have had little rain, yet so many days it looks like it will down pour, wind and all. Then nothing. So many plants got cut back today because of so much browning. All the roses browned, so they got chopped, and my poor foxgloves, but you should see all the babies they made. I am happy about that if I can keep them alive during this dry spell. Jackdaws are uprooting my sedum roof. How do i stop/discourage jackdaws from pecking holes in it? This is really fascinating! Thanks for sharing! Thank you for reading, Bill. I hope you are inspired to install a green roof.